Medicare Supplement Plan A, also known as Medigap Plan A, is often referred to as the Basic Supplemental Insurance Plan. Like all Medigap plans, Medicare Supplement Plan A is standardized, i.e., its benefits are the same no matter which insurance company offers it. Price for this plan, however, may vary significantly. All insurance companies selling Medigap policies must offer Plan A.
Medicare Part A coinsurance, plus 365 additional days after Medicare benefits end. Medicare Part B coinsurance (20% of Medicare-approved expenses) or copayment. Skilled Nursing Facility Care coinsurance (20% that Medicare does not pay). Part B Deductible: $185 per year in 2019. Medicare Part B Excess Charges (Doctor’s charge above the Medicare-approved amount). Foreign Travel Emergency – Medicare coverage outside of the US. When is Medigap Plan A the right choice? Medicare Supplement Plan A offers only the basic coverage; therefore its price is more affordable compared to any other plan. Enroll in this plan if you prefer to have only critical benefits, and are prepared to assume the remaining risk. For some, this plan is the right choice. With 10 Standardized Medicare Supplement plans, it can be challenging to select the right plan. 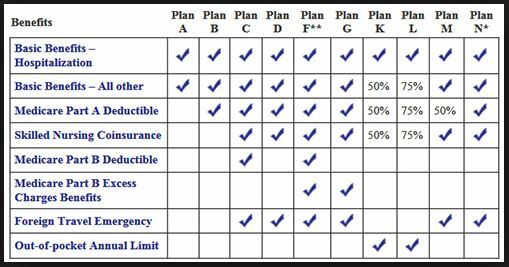 Not all Medigap providers carry all plans, and the difference in premiums for the same type of plan among different vendors may be quite substantial. Using the expertise and advice of Liberty Medicare will be to your advantage. We can help you find the Medigap plan that is best for your needs and budget. All of our services are absolutely free to you! Learn more about all the benefits of working with Liberty Medicare. Get a free Medicare Supplement Insurance Quote, or please call us at 877-657-7477. Our specialists are ready to answer your questions.